What we are celebrating today is the 60th anniversary of the teaching and scholarly career of a quiet giant in the law. Quiet in that Johan in consummately modest, humble, and unassuming. He rarely draws attention to himself. He does not deal in pride or pretension. He shows up faithfully for everything and everyone, but he does not push to the front of the line, nor does he ask often for the floor. But he is a giant in the legal academy with high standing around the globe for his brilliant contributions to many fields of legal study, captured in a score of books in multiple editions and languages, and 300 plus articles. He has stood at distinguished lecterns on every Continent, save Antarctica, and in the last few years has traveled to India, China, Morocco, Belgium, Bulgaria, Singapore, Chile, and various cities in North America and South Africa to give lectures and lead conferences. In the 1970s, he added human rights to his scholarly repertoire. This soon got him in trouble with both the conservative churches of his community and the apartheid state of South Africa. Many local Protestant churches thought human rights to be a dangerous product of Enlightenment liberalism and individualism, which biblical Christians should firmly reject. But Johan argued powerfully and patiently to the contrary that human rights are God’s gifts to human nature which should be enjoyed and exercised by every human being, regardless of color, class, confession, or sexual orientation. The apartheid state, in turn, reserved human rights to the white elite, leaving vast portions of South African society trapped in dire poverty, illiteracy, and oppression with little legal recourse or protection. Johan risked much in speaking out against these racist and apartheid policies using the spotlight of human rights to expose the grave injustices that these state policies inflicted. He was soon rejoined, rebuked, censored, demoted, and then dismissed from his deanship at Potchefstroom, and eventually forced to leave the university and take up a position at the University of Witwatersrand in Johannesburg. While now a pariah in some conservative religious and political communities, Johan became a powerful anti-apartheid voice in South Africa, and a champion of human rights which he defended in and on Christian philosophical and jurisprudential terms. He wrote several path-breaking books and articles in this field and led workshops and lectures around South Africa and well beyond. In 1976, he flew to New York City and walked in without appointment to the Ford Foundation offices, asking them to support the burgeoning human rights movement in South Africa. They gave him several large sacks of cash to continue the effort. In 1979, he organized the first great international human rights conference in South African history, hosting it in the glorious city of Cape Town. There he helped introduce the world to a still regional hero at the time: Archbishop Desmond Tutu. He argued constitutional cases in the South African courts on behalf of racial minorities. And he remained one of legal engineers, along with his many students and a growing body of coworkers, of the anti-apartheid and then the constitutional reform movements of South Africa in the later 1980s and early 1990s. 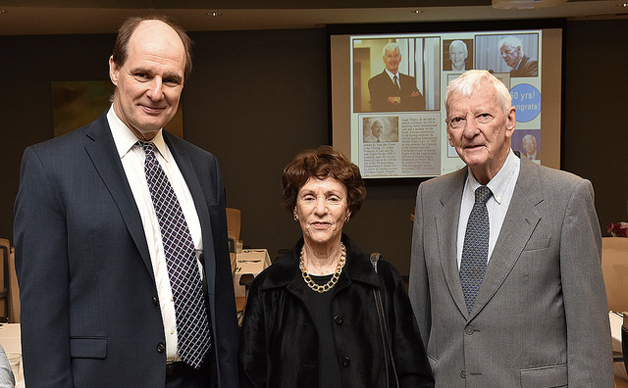 Johan’s work attracted the attention of our a leading Emory Law School colleague, Thomas Buergenthal, and eventually of President Carter and his human rights team at The Carter Center. They invited him in the early 1990s to make regular visits to Emory. He was appointed in 1995 as the Senior Fellow of Human Rights at the Carter Center and the I.T. Cohen Professor of International Law and Human Rights at Emory Law School. My colleagues and I in the law and religion field saw the power of his mind, heart, and work, too, and we drew him into leadership of a series of projects on democratization, religion and human rights, religious freedom, proselytism, children’s rights, and more. He has continued to serve brilliantly as Senior Fellow in Law and Religion in our Center. After moving permanently to Emory, Johan added yet another thick layer to his scholarly work. While retaining his earlier legal specialties, he now took on the new subjects of public international law, international humanitarian law, the laws of military conflict, and international criminal law. He followed his trademark method of learning by doing, as he took each of these topics, and wrote voluminously on each of them and created new courses, seminars, and public lectures. He is bringing this new phase of work into a capstone three-volume work on the international criminal court, forthcoming from Cambridge University Press. In his 60th year of teaching, the man still teaches a five-course load, gives five or more public lectures around the world, publishes 5 major articles, writes five chapters for his next monograph, and flies five times back and forth to South Africa as if he were commuting to Macon. On some of these recent trips back to his native land, Johan has finally gotten his just due, as he has been decorated with all manner of academic awards, tributes, and citations, including an appointment as Professor of Law Extraordinaire at the University of Pretoria. And in sublime acts of sweet justice, the University of Zululand gave him an honorary doctorate for his courageous advocacy for black South Africans. And eventually his own alma mater at the University of Potchefstroom gave him an honorary doctorate for his courageous prophecy to white South Africans. We have a quiet giant in our midst. I bid you to rise and join in robust applause in praise of a great man, scholar, teacher, and friend.